This year’s f8 didn’t see comedian Andy Sandberg bumbling around on stage parodying Mark Zuckerberg. And that was smart, because Facebook is no joke to the millions of developers that earn their livelihoods on the social network. Instead, f8 focused on washing away the perception of Facebook’s platform as hostile and unpredictable for developers and giving them new ways to grow their apps and make money. That might not be exciting to the general public. Zuck’s keynote lacked the flare and emotion of the last f8 in 2011 like Timeline launched. Rather than muddy the developer conference with consumer launches, the message was clear. Facebook has grown, and it’s ready to earn developers’ trust. Zuckerberg said Facebook wants to be a “cross-platform platform” that rides across iOS, Android, Windows Phone, the web, and more. That’s a convenient framing of the fact that Facebook doesn’t own a mobile operating system. Still, given its status as a social layer, the f8 announcements did a good job of not reaching too far or promising too much. Many squarely align Facebook’s objectives with those of developers. If it can help developers grow and build better apps, it will endear them to its platform and get their apps big enough so they can contribute significant amounts of content back to the News Feed and buy Facebook ads. So below when we say Facebook did something to help developers grow, know it’s not totally altruistic. You can check out our full coverage, but here’s a summary of all the f8 launches and what they mean for Facebook. 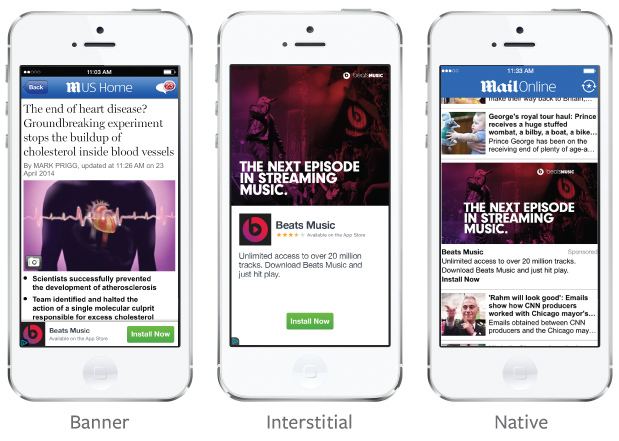 A mobile ad network that lets advertisers use Facebook’s personal data to target both standard banners and custom native ad units on third-party publisher apps. Facebook earns a cut of what advertisers pay, and pays the rest to the developers so they have a way to monetize their ads. Why? To earn lots of money. Rather than cluttering its own site and apps with more ads, Facebook can monetize its deep database of volunteered personal and activity data with ads shown elsewhere. Facebook rolled out its previously tested Autofill product to the 450,000 merchants that have built e-commerce sites using Ecwid’s platform. Autofill lets customers auto populate their credit cards, billing and shipping info in third-party e-commerce checkout processes using the data they have on file with Facebook to make purchases quicker. Why? Facebook doesn’t take a cut, but instead will use the purchase data slurped up by Autofill to prove its own ads deliver a return on investment for e-commerce apps. 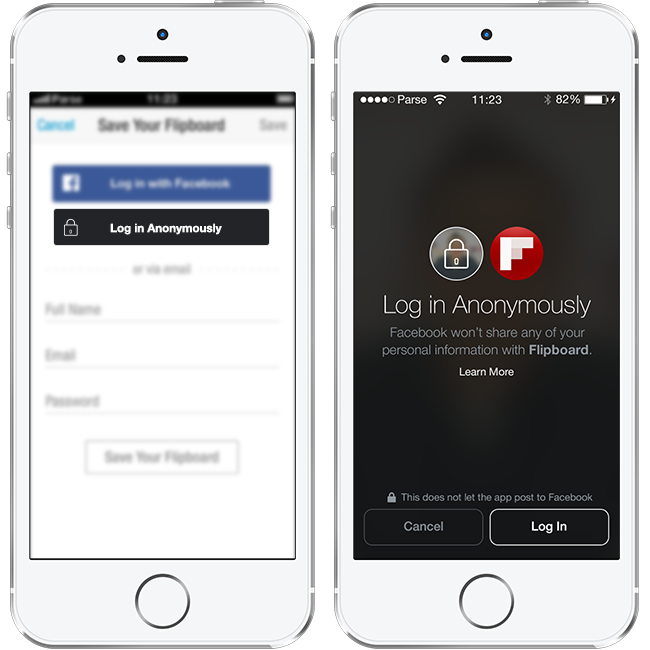 A way to “Try Before You Buy.” Anonymous login lets Facebook users sign up and demo third-party apps without having to create another username and password or give up their personal data until they’re sure they like the app. It’s not totally anonymous, though, as Facebook can still track the user’s app activity. Beyond anonymous trial modes, it could let developers build ‘anonymous-first’ apps like a Secret clone that doesn’t employ a user’s name but still maintain a profile that can save their previous activity like posts, high scores, or progress. Why? To make users more comfortable logging in with Facebook instead of using their email address when they want to try a new app. If users later give their name and sharing permissions, Facebook can monetize the content then share back to the feed, and either way it endears developers. Facebook could also use the system to power its own ‘anonymous first’ apps. Facebook announced plans to stop letting developers pull data from users’ friends, such as their photos, birthdays, status updates, and checkins. Why? Because the idea that anyone could give someone else’s data to a developer without their permission was always kind of shady. This should boost a perception of privacy on the Facebook platform, but also deny developers the ability to build apps like photo album browsers, search engines, calendars, and location maps that could compete with Facebook’s own products. Previously, apps asked users to provide all their personal data and sharing permissions in two big screens. Soon, developers will have to provide a checklist of each data type and permission they’re requesting, such as friend list, Likes, email address, and the ability to post to the News Feed. Why? To give users more privacy, transparency, and control when giving data to third-party apps, making them more trusting of logging in with Facebook and the company in general. Facebook themed f8 around a “Stable Mobile Platform” and changed its mantra from “Move Fast And Break Things” to “Move Fast With Stable Infra”. It promises not to scrap any core API without giving at least two years of notice. Why? So developers will be more willing to build on Facebook’s API, as they can be confident Facebook won’t pull the rug out from under them like it used to. Including issuing app-scoped user IDs for added security, a test app framework, a Social Context API to surface a user’s friends’ activity in apps, a Tagged Places API for leverage where someone has been, and improved tagging and invites in stories that apps publish. Why? To make it easier to build more powerful apps on its platform. A program that gives fledgling developers $30,000 in free dev services from Facebook and 11 third-party companies such as UserTesting.com which provides A/B testing and bug spotting, and Adobe Creative Cloud for cloud storage of creative projects. Why? So Facebook can jumpstart apps in the hopes they grow big enough to offset the $30,000 with ad buys and contributed content. A Like button that can be embedded in mobile apps so users can easily share content back to their friends via the News Feed. Why? To get more content shared to the feed where Facebook can monetize it with ads, while also helping developers grow their apps. A tool that lets developers of web apps help their users remind themselves with a push notification to download the companion mobile app. Why? To help developers grow. The option developers can embed in mobile apps that lets their users privately Facebook Message friends with in-app content or a link to the app itself. Why? To boost Messenger engagement and help apps grow. An open-source initiative to give developers a cross-platform way to deep link to and between specific content buried inside their apps. The deep links launch the corresponding app and open the specific screen instead of opening a browser window to a top-level download page for an app. Why? To proliferate deep linking so they can buy Facebook’s mobile re-engagement ads which could link you to a discounted New York City hotel in HotelTonight when you’re in town instead of the homescreen of HotelTonight. New APIs allow TV shows and other media to visualize the buzz on Facebook. These include listing de-personalized Trending topics, “Trending Insights” to show demographic info on who’s discussing trends, Topic Feed to show public posts mentioning the topics, and Hashtag Counter to tally mentions of hashtags. Why? Facebook wants more media outlets showing its public and current events discussion data to the masses so more people turn to Facebook to discuss real-time news and content instead of Twitter. Instead of a tiered system, Parse now offers a very liberal free tier and then charges developers by usage after that. The free tier gives developers 30 API requests per second, 20GB of file storage, 20GB of database storage, 2TB of file transfer, and 1 million push notifications, and they can pay for more. Why? To make Parse more appealing to try for free so developers get addicted to the mobile-backend-as-a-service and end up paying. Parse updated its analytics product to give developers deeper insights into their audience and user retention. Offline storage helps developers store app data locally on devices so they run even when there is no connection. Why? To make Parse more robust so more developers build on it and pay for it. Facebook and Ericsson debuted the first public, physical incarnation of the Internet.org project to connect the remaining 5 billion people to the Internet. Developers could test their apps on a simulated low-bandwidth network complete with slow and spotty connections common in the developing world. Why? To show Internet.org is more than just talk, and help developers root out bugs that could break their apps if run on the affordable Internet that Facebook hopes to spread through drones, satellites, lasers, and industry partnerships. Facebook will soon open source a tool called Display Node that powers its app Paper, allowing developers to render animations more smoothly. Why? To improve recruiting by showing off Facebook’s mobile engineering prowess, help developers improve and grow their apps, and get community assistance for iterating on DisplayNode. If none of these launches strikes you as monumental, you won’t have to wait as long for more big developer updates from Facebook. Instead of waiting years until Facebook thinks it’s time, Zuckerberg said f8 will now occur annually. Hopefully by then it will have learned to have its after-party less than three hours after the conference concludes. By the time Diplo took the stage under a projection mapped lighting rig, the DJ was mostly spinning for Facebook employees and volunteers.